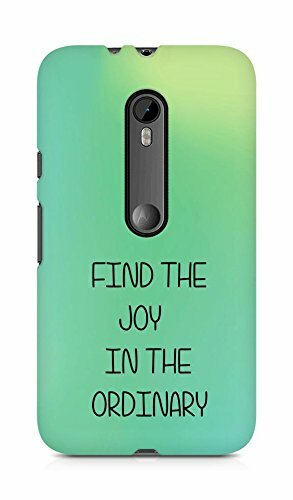 AMEZ find the joy in the ordinary Back Cover For Motorola Moto Turbo@299 Rs [Mrp:-899] - Onlinedeals.discount - A leading product discovery website. Find the true prices of products, read reviews and buy top brand products at reasonable prices. Full Body HD Print: Printed on all visible sides, Unified artwork is used and is printed at high resolutions to give your case a quality look. Definitive Protection and Clean Look: This exceptionally durable and high quality polycarbonate case covers all the edges of the device, the raised lip protects your screen in case of an inadvertent fall, ultra-thin gauge assures that you don’t spoil the look of your device. AMEZ designer printed phone cases are best in class. The case is made out of thin, highly durable polycarbonate material which gives your device the protection it needs. It is designed to fit your mobile device to perfection. Every cover is printed with excellent precision using our MT4 technology. Colors used are of high quality and very accurate. The print is extremely durable and of very resolution. Each case cover goes through a rigid QC workflow and the end result is nothing less than outstanding.